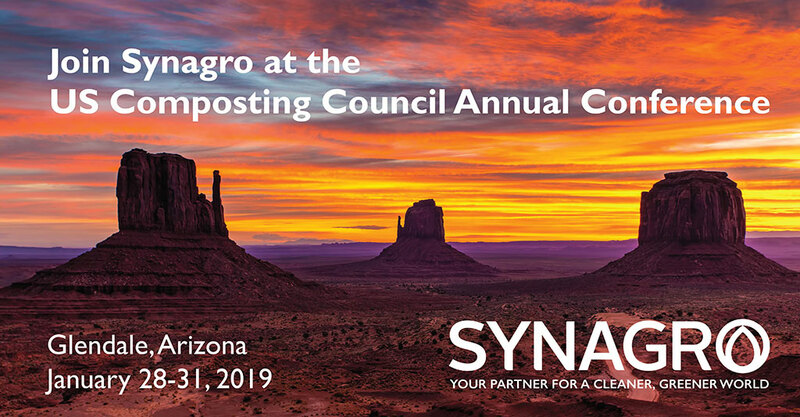 BALTIMORE, Maryland, January 22, 2019 – Synagro Technologies, Inc., one of the largest private composters in the United States, will highlight its AllGro® compost at COMPOST2019, the US Composting Council’s 26th Annual Conference and Tradeshow, in Glendale, Arizona, January 28 to 31, 2019, at Renaissance Phoenix Glendale Hotel & Spa. Join the Synagro team inside the Renaissance at Booth Number 701 to learn about AllGro compost – a nutrient-rich source of organic matter that brings agronomic value to almost any application. Made from carbon-rich feedstocks, AllGro compost is the result of a natural, controlled, biological process. The end result is a high-quality soil amendment used by professionals in agriculture, horticulture and landscape maintenance. “We are pleased once again to be supporting the composting industry and to be exhibiting at COMPOST2019 in Glendale,” announced Robert Pepperman, director of product sales and marketing, Synagro. “We’re excited to be showcasing AllGro compost because, when used in accordance with sound agronomic principles, it provides both immediate and long-lasting benefits. In addition, we are looking forward to sharing a segment of a recent episode of RFD-TV’s American Farmer in our booth in which Synagro’s compost manufacturing program is featured.